Mark Grimaldi rose to the position of General without his family’s influence or a wife by his side. Now Mark wants to be the Secretary of the Home Office serving as the head spy to all other spies in England and in order to make that happen he must reconcile with is 10 years estranged wife, Nicole Huntington Grimaldi. Nicole and Mark separated shortly after their wedding under very heated circumstances and yet after all these years of enjoying her freedom and life in France Mark shows up begging for a reconciliation on paper only. Mark must appear to be a happily, steady married man and only Nicole can accommodate that request. However, Nicole is willing to provide him a wife but she also has a request and one that shocks Mark to the tips of his toes. Nicole wishes to be a mother and the only legitimate way to make that happen is with Mark’s assistance which is readily agrees to but he wants the intimacy to have meaning not be a cold, distant coupling and Nicole fears if they do just that she will be back into the space where her love and obsession for Mark are returned. Nicole cares not for any title, or appointment Mark ever had she just loved him and now in order to have a baby that will be the love she desperately needs right now agreeing to Mark’s terms is a fact and her worst nightmare. While Mark and Nicole spend days and nights together rekindling their friendship as well as their intimate relationship both are tested to see where they stand with each other when Mark’s cousin and next in line for duchy is murdered. Mark is now the heir apparent to a title and family he has refused to acknowledge his entire life, but they are here now and not going away so Mark does what he does best and finds the murdered. Nicole always had the knack for solving crime which is why the Bow Street Runners always relied on her abilities and Mark pulls her along for the crime solving part of their newly formed life and discovers that she is as smart as she is beautiful. With each night together they are both pulled into a dance neither forgot how to do, but fight to allow their love for one another to show. What has kept them apart can also draw them together and love will seal the deal of commitment. Valerie Bowman shows readers how book after book a great writer can lay out a story, build characters, and pop the romance between the alpha male and female. I really enjoyed this Regency romance with unforgettable characters, family drama, mystery, and so much more that kept me entertained and intrigued from the first page to the last. Once I started reading, I couldn’t put the book down because I didn’t want to wait to see what was going to happen. I loved General Mark Grimaldi and his wife, Nicole, who are stubborn, prideful and passionate in their second chance at love and happiness. I really liked how snippets of their past were seamlessly inserted so I could better understand this couple. This is the first book I have read by Valerie Bowman but it definitely won’t be the last. This is a must-read for anyone who enjoys well-crafted Regency romance. 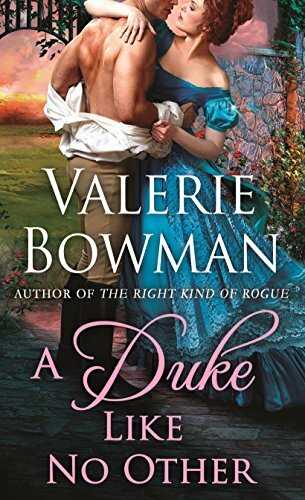 I received an advance reader copy of A Duke Like No Other from the publisher via NetGalley and this is my unbiased review. I liked the book so much, I purchased a copy for my keeper library to read again later. I really enjoyed this story. It kept me interested from beginning to end. A very independent, strong minded heroine in Nicole. And a very dominant, strong, fair minded hero in Mark. So needless to say, it was a very combustible relationship for both good and bad. Throw in a murder mystery and you have the makings of a really good book.